The vision and the faculty divine; Yet wanting the accomplishment of verse. We lift ourselves by our own thought; we climb upon our vision of ourselves. It's one thing to see a vision; it's another thing to be seized by a vision. When you have a specific vision for something, you just go in and attack it. You have to see the pattern, understand the order and experience the vision. 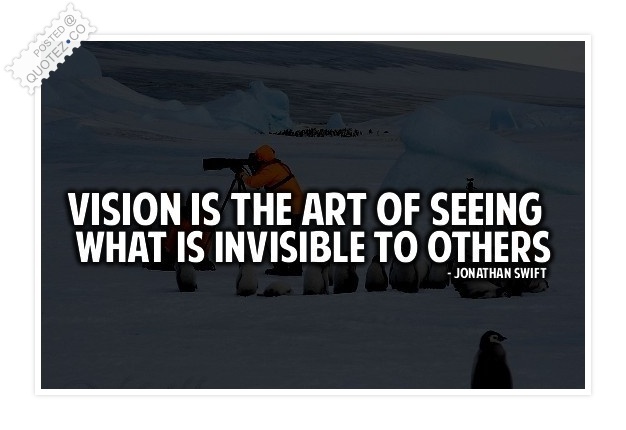 True vision is the ability to see in another more than they are showing you. Sight is what you see with your eyes, vision is what you see with your mind. All lovers live by longing, and endure: Summon a vision and declare it pure. You can't drive into the future if you are looking into a rear vision mirror. I have a vision of the world as a global village, a world without boundaries. Every new experience brings its own maturity and a greater clarity of vision. Many-sidedness of culture makes our vision clearer and keener in particulars. Let's be pastors who cast vision that are worth people giving their life for. One effect of sustained conflict is to narrow our vision of what is possible. Be persistent, and hang on to your vision. And at the same time, be flexible. The Goal can disappear From the mind's sight But not From the heart's vision. He's a gritty hockey player, he's got good vision, he's an intelligent player. The richest source of creation is feeling, followed by a vision of its meaning. If your vision doesnât compel, move or stir people, your vision is too small. Fond man! the vision of a moment made! Dream of a dream! and shadow of a shade! 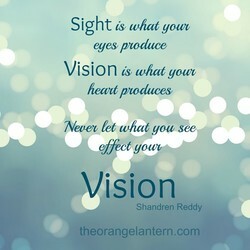 Blindness is an unfortunate handicap but true vision does not require the eyes. One of the liberating things about having a blog is the total vision it allows. To accomplish anything you must first have a mission, a goal, a hope, a vision. Humility is nothing but the disappearance of self in the vision that God is all. The real function of the artist is to give fresh vision to their own generation. It's quite amazingly radical, what their [the Kochs] vision of America would be. Artists paint not for their own enjoyment but to share their vision with others. Surrealism to me is reality. Psychedelic vision is reality to me and always was. As long as you are passionate about your vision, you should keep moving forward. Search back into your own vision- think back to the mind that thinks. Who is it? Ich habe immer an meine Vision von purem Design geglaubt und nie lockergelassen. A man will remain a rag-picker as long as he has only the vision of a rag-picker. When God gives a vision, transact business on that line, no matter what it costs. Ikhlaas is to forget the vision of creation by constantly looking at the Creator. The world is waiting for men with vision - it is not interested in mere pictures. Vision is an important part of being a good editor, but so is teamwork and grace. It is better to fail with your own vision than to fail with another man's vision. A writer is basically someone who shares his or her value or vision of the world. The NSA's vision statement is: keep the problem going so the money keeps flowing. Feet sandaled with dreams tread paths of vision leading to wisdomâs sharp peaks. Building a visionary company requires one percent vision and 99 percent alignment. Churches whose members fight with one another have lost their vision for the lost. Every fight is one between different angles of vision illuminating the same truth. The best leaders operate in four dimensions: vision, reality, ethics, and courage. Have a strong vision about the story you want to tell and how you want to tell it. If your vision doesn't scare you, then both your vision and your God are too small. Therefore art means: you have to believe, to have faith, that is, cultivate vision. You've got to tell a story, paint a vision, know your metrics and sell, sell, sell. Education should serve to enlarge the vision and broaden the outlook of the people. 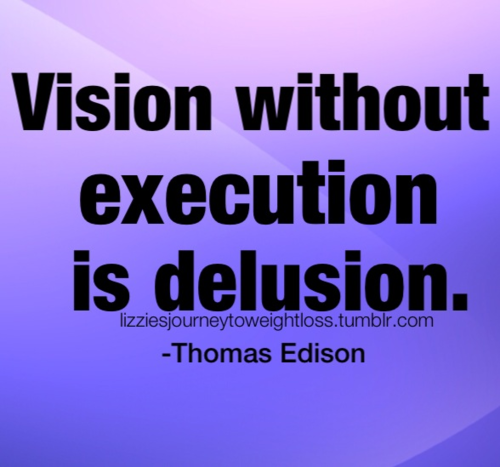 In the end, a vision without the ability to execute it is probably a hallucination. Ronald Reagan had a vision of America...Barac k Obama has a vision of Barack Obama. The only human value of anything, writing included, is intense vision of the facts. Our vision of a sustainable future will only materialize through action taken today. Your path and purpose will become crystal clear when you begin to trust your vision. We start out in our lives as little children, full of light and the clearest vision. Winners bring reality up to their vision. Losers bring their vision down to reality. The clearer your vision becomes, the easier it is to guard what God calls you to do. The fact was I had the vision... I think everyone has... what we lack is the method. Man arose to high moral vision two thousand years before the Hebrew nation was born. Any realistic vision of change must be based on the notion of empowerment of people. If there's anything I can do, it's to present an alternative vision for the country. It's really cool because it's all exactly my vision. I'm not watering anything down. If your child is more important than your vision of your child, life becomes easier. Call Berlin. Drop everything we're doing. I have a complete vision of what should be. The greatest justice in life is that your vision and looks tend to go simultaneously. There's all kind of vision in this Book. Just open it up and your people will follow. You are there to support the vision of the people who you choose to excute the movie. By my teaching I hope to inspire you to personal activity and to present your vision. To hold an unchanging youth is to reach at the end, the vision with which one started. In the wake of my spiritual experience there came a vision of a society of alcoholics. The vision of time is broad, but when you pass through it, time becomes a narrow door. Words are what make the song. I get a personal vision about what the lyrics are about. Ignore the people who tell you it won't work, and hire people who embrace your vision. The iPad is the clearest expression of our vision of the future of personal computing. Your vision is not limited by what your eye can see, but by what your mind can imagine. Part of being a writer is defending your vision and not caving in to outside pressures. 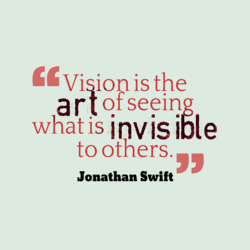 You must find a way to get your vision seen, implemented, and contributed to by others. There are a lot of pastors who have a vision and have not yet seen it become a reality. For those with drive, wit, vision, ego and a masochistic outlook, there is always room. You can live your life out of a circumstance or you can live your life out of a vision. If people don't have their own vision, all they can do is 'sign-up' for someone else's. ... This is the paradox of vision: Sharp perception softens our existence in the world. Learn to see, and then you'll know that there is no end to the new worlds of our vision. Break the mold! 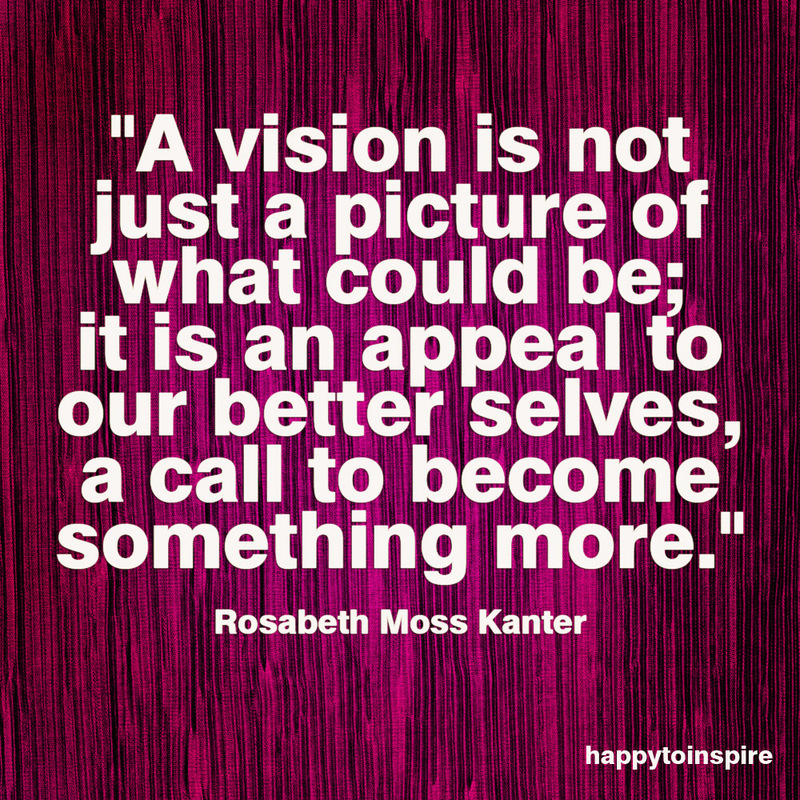 Have the biggest vision you can! If you can't dream it, it cannot occur! It is critical vision alone which can mitigate the unimpeded operation of the automatic. A man's pursuit of knowledge is greater than his shortcomings, the limits of his vision. I believe in magic, and having a vision. The tough times made me a warrior. I work hard. In my vision, the thing that man needs first and foremost is a meditative consciousness. Behead yourself!... Dissolve your whole body into Vision: become seeing, seeing, seeing! Your time on this earth is limited, don't live someone else's life, live by your vision. Let an idea swim to the surface like a fish in a pool...let the mind drift to the vision. The vision of milk and honey, it comes and goes. But the odor of cooking goes on forever. The success of a vision is determined by its ownership by both the leader and the people. The cornerstone of religion, a clear vision can inspire great action and firm conviction. My idea is to bring happiness, respect, vision. poetry, surrealism and magic [to design]. 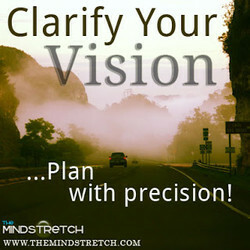 Clarity of vision - what you've been looking at from the wrong angle and not seen at all. Inner seeing has nothing to do with physical vision; it's the perception of life directly. People of vision gauge decisions on the future; the story of the past cannot be rewritten. The photographer's vision convinces us to the degree that the photographer hides his hand. The function of art is to free the spirit of man and to invigorate and enlarge his vision. I have a vision for a world where business is the most powerful force for positive change. If you provide the drive, dream, and vision, with God's help, you can accomplish anything. Few lack talent, but most people lack the vision and perseverance to develop their talents. The vision of the Divine presence ever takes the form which our circumstances most require. 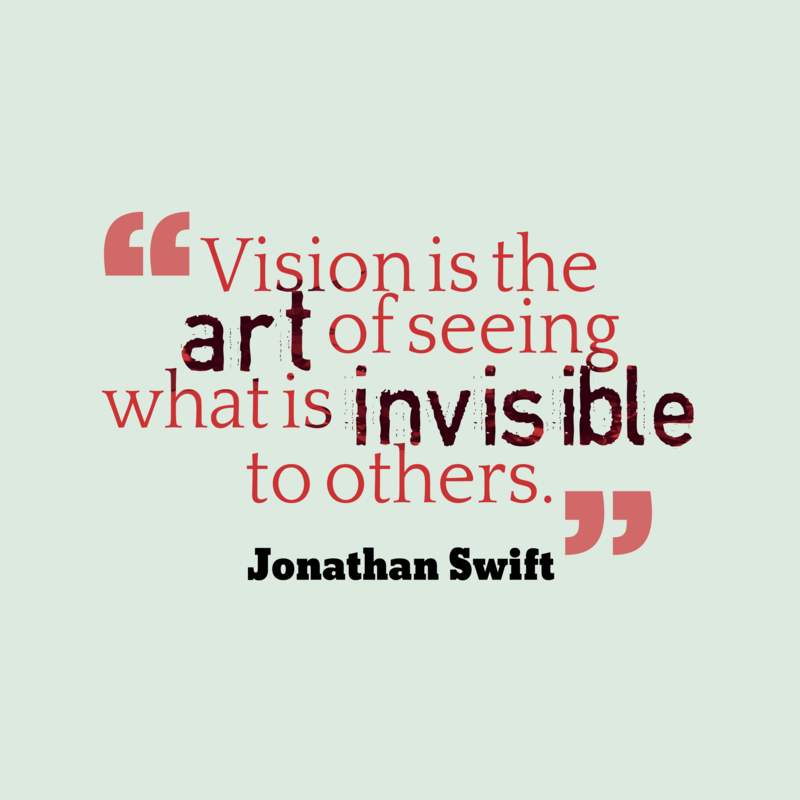 Vision is a lot more than putting a plaque on the wall. A real vision is lived, not framed. If you let too many cooks in the kitchen it could cloud your vision of what you want to do. Success is different for every artist - I get psyched when i help realise their vision etc. Vision encompasses vast vistas outside the realm of the predictable, the safe, the expected. 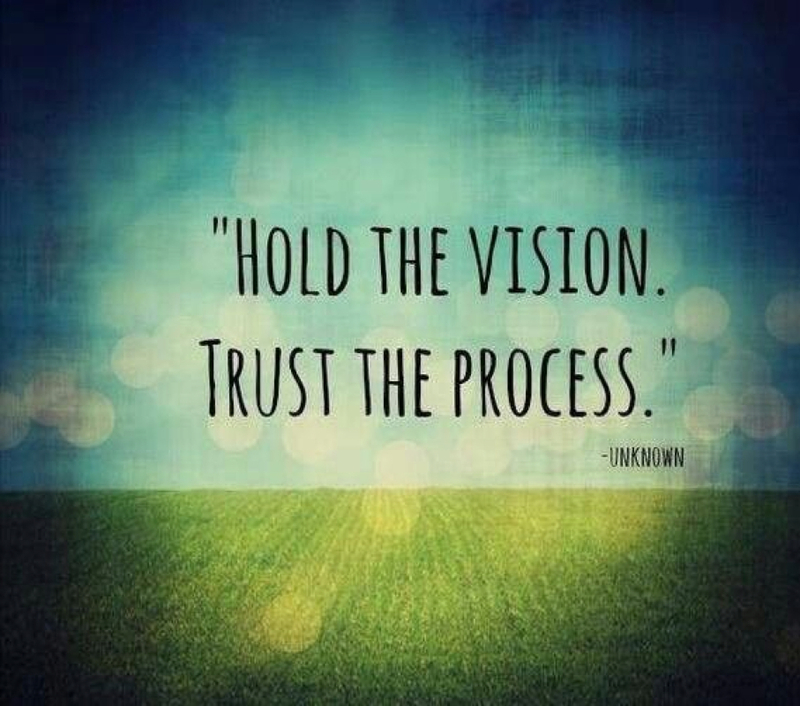 If you have a vision, no matter how difficult things are, everything just becomes a process. We all have circumstances, choose not to live in your circumstance, but live in your vision! 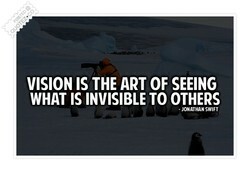 Why limit yourself to what your eyes see when you have an opportunity to extend your vision? I'm tearing down Route 80 East, the sun's on my right side. I'm drunk, but my vision's good. That larger vision is certain to make clear the value in our own lives of service to others. Later in the day, a second verse became clear to my vision. It read: "Pray without ceasing." Every time I had a vision of myself lying dead somewhere, it was up there, in the Highlands. I created a vision of David in my mind and simply carved away everything that was not David. Before a vision (dream) can become a reality, it must be owned by every member of the group. 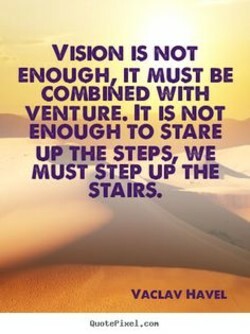 Have a vision. Communicate it clearly. Pick the right people and put them in the right jobs. Children have two visions, the inner and the outer. Of the two the inner vision is brighter. If you feel something in your heart, if you have a vision for it, then it's no longer a risk. As a leader, your job is to energize people around the mission and vision you've articulated. 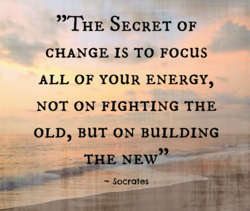 Help people see themselves in your future vision to motivate them to help make change happen. Confronted with the vision of a beautiful garden, we see something beautiful about ourselves. Jesus gives us hope because He keeps us company, has a vision and knows the way we should go. Nothing as mundane as mere evidence can be allowed to threaten a vision so deeply satisfying. Believe in your strength and your vision. Learn to repeat to yourself, 'It all depends on me'. A great artist has a unique vision...obsession. They are someone willing to fail flamboyantly. Great vision communication usually means heartfelt messages are coming from real human beings. Make sure your vision is biblical. You want to make sure you can defend the vision biblically. I just have a vision of something, and it seems to go a long way. One thought goes a long way. Have a vision and then create your own reality. Otherwise, someone else may create it for you. The people's prayer, the glad diviner's theme, The young men's vision, and the old men's dream! To be an artist is to take responsibility for the world's destiny. You shape it by your vision. Just look at me! Beauty. Style. A little vision of perfection. I love myself and that's enough. A leader without a vision is just a letter without a stamp; it can never reach his destination. Vision is easy. Ideas are even easier. It's execution that separates the amateurs from the pros. The best way to preserve a child's vision is to let them see things their way rather than yours. Don't let negativity affect your vision. People say harsh things, but don't let them affect you. Skills are never taught, they are acquired. I can give you a camera, but can't feed your vision. Labels cloud our vision and distract us from seeing how much we have in common with one another. To regain her lost power the Church must see heaven opened and have a transforming vision of God. Ultimately when I throw myself behind a movie, I have to really believe in that directors vision. When we have a vision of what we can become, our desire and our power to act increase enormously. Directing for me is the ability to take the words from a page and share my vision with the world. Growth has no limit at Reliance. I keep revising my vision. Only when you dream it you can do it. By love, harmony and beauty you must turn the whole of life into a single vision of divine glory. To deny women directors, as I suspect is happening in the States, is to deny the feminine vision. As other perceptions arise...the total vision of human possibilities enlarges and is transformed. Ask yourself, 'What is obstructing my vision?' What is the difference between seeing and looking? We rob men of a greater vision of God because we will not give them a lower vision of themselves. I have seen the vision and for self I cannot live; Life is less than worthless till my all I give. Create a vision of who you want to be, and then live into that picture as if it were already true. Excellence Matters. Excellent people. Excellent vision. Excellent marketing. Excellent strategies. 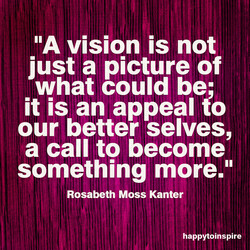 When somebody tells you he or she is leading something, a fair question is, "What is your vision?" We must regain our vision and hope and move our country forward on an agenda of peace and justice. 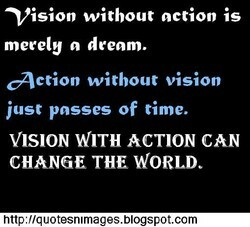 This it the greatest success I can dream of for my life: to have spread a new vision of the world. I will see beauty and goodness in all things. From all that is unlovely shall my vision be immune. Moses goes to the top of the mountain and he comes back glowing, transformed. He became the vision. That's what leadership is all about: getting somebody to see your vision and believe it's possible. The Curious Incident brims with imagination, empathy, and vision " plus it's a lot of fun to read. . . .art is a discovery of harmony, a vision of disparities reconciled, or shape beneath confusion. 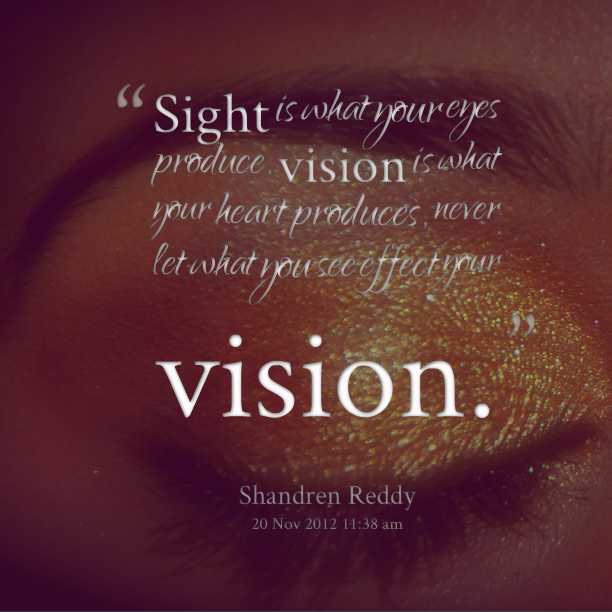 True vision is always twofold. It involves emotional comprehensions as well as physical perception. the compulsion to work long years in pursuit of some inner vision must be fueled by stubborn fires. The desire to order other people around and make them conform to one own's vision takes many forms. Vision - You dream the impossible; You imagine the incredible; You achieve the extraordinary. People not only need a gospel-inspired vision of work, but they need a new vision of the Scriptures. As an actor, I'm limited to re-in acting someone else's vision or portraying a fictitious character. It's much more powerful and compelling to create a positive vision than it is to tear somebody down. As long as I stay true to what I believe is a good movie and what is my vision, that's all I can do. A vision and strategy aren't enough. The long-term key to success is execution. Each day. Every day. The first step toward changing the world is to change our vision of the world and of our place in it. And it falls to a true leader to see to it that his or her people have an inspiring vision to pursue. What I'm identifying with is the vision or the idea - whatever was the little nugget that started it. Most pastors have a hard time grasping a vision. 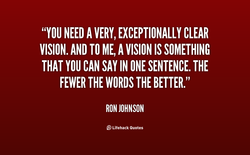 But vision is the indispensable quality of a leader. Gibson ES 125 was a real instrument, this was in 1956. I started learning; I had a vision of a sound. Define the limits of your vision: Having this, you will not be poorer Than a man who rules a dukedom. There are some things the arrogant mind does not see; it is blinded by its vision of what it desires. When God gives us a vision, we must transact business with Him at that point, no matter what the cost. Your vision, ideas and plans have the power to shape the future, but not if you keep them to yourself. A leader's responsibility is to cause a vision and mission to have tangible results in the real world. Every time you share your vision, you strengthen your own subconscious belief that you can achieve it. May we catch enough of a vision of Christ that we will not be satisfied unless we know him more fully. My short-term vision is the abolition of nuclear weapons. My long-term vision is the abolition of war. Our vision is only actionable if we share it. Without sharing, it's just a figment of our imagination. The core of any family is what is changeless, what is going to be thereââshared vision and values. 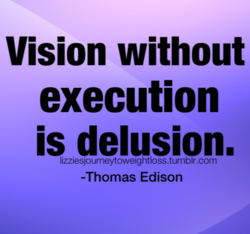 Work without vision is drudgery. Vision without work is dreaming. Work coupled with vision is destiny. My father believed very strongly in Ataturk. Ataturk was a very powerful man and a man of great vision. Don't tell them what you're going to do - that's vision. Do what you are going to do " that's culture. His vision was just outstanding. If you think of him in the same way as Pele then you would come close. I believe that the people are looking for a leader who has experience, who has courage, who has vision. One advances by standing on the shoulders of giants, but the ultimate goal is to find one's own vision. Leaders may inspire, but only when the people decide to act does the leader's vision become a movement. Movies are the work of a collective conscious. It takes 500-800 people on a movie to complete a vision. I think that leadership more than anything is about setting a course and describing a vision for people. The worst thing in the world is not to be born blind, but to be born with sight, and yet have no vision. One needs to have some sense of purpose. Next, you need to have a vision that grows out of that purpose. I have heard it said that living out of our vision is more powerful than living out of our circumstance. If you create a vision for yourself, and stick with it, you can make amazing things happen in your life. Whoever buys into the vision God has for the congregation develops an affinity for all that is going on. Pain narrows vision. The most private of sensations, it forces us to think of ourselves and little else. Mount Shasta - a vision of immensity such as pertains to the vast universe rather than to our own planet. Never confuse desire with vision. Desire has to do with what we want. Vision has to do with what we need. The Biblical vision is not so much concerned with life after death but about life after life after death. It is a good thing to let someone else's vision take over, and it has always been a good thing in the end. Anything under the sun is beautiful if you have the vision it is the seeing of the thing that makes it so. 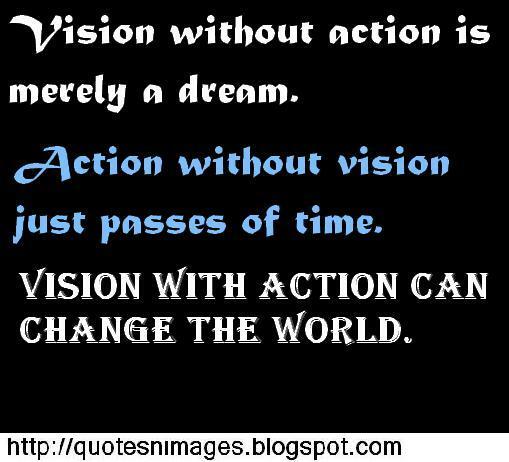 Vision remains vision until you focus, do the work, and bring it down to earth where it will do some good. Jim Jarmusch: Poets are always ahead of things in a certain way, their sense of language and their vision. Marjorie Agosin proves the power of the word to transport us to the center of her humane and human vision. I'm not someone who likes having a master plan for everything, but I do believe in a vision for your life. Your director is your everything and you devote yourself to them and you want to help create their vision. HermÃ¨s and my own brand share the same philosophy, the same vision of women, but the two aren't identical. At the end of the day, you cant have a vision; you have to have a hope. This is where the miracle comes in. A script like Nightcrawler gives me an opportunity to truly realize a vision thats mine, which is exciting. The individual's right to pursue his own vision of the best ration of pleasure to pain: utterly sacrosanct. Necessity can set me helpless on my back, but she cannot keep me there; nor can four walls limit my vision. If there is hatred in your vision, you will see hatred everywhere. 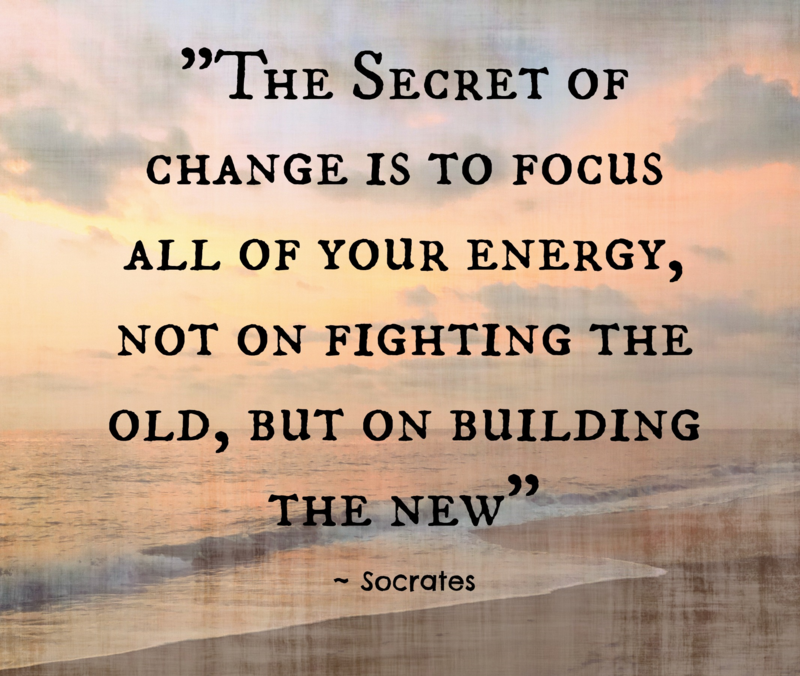 Hence, change your vision to start with. Vision is the ability to talk about the future with such clarity it is as if we are talking about the past. irony is an indispensable ingredient of the critical vision; it is the safest antidote to sentimental decay. He's got great vision. If he can get outside, he can take it all the way. That's what we were worried about. I love thee - I love thee, 'Tis all that I can say, It is my vision in the night, My dreaming in the day. You can live and lead small, live and lead safe, live and lead selfishly, or you can pursue a grander vision. If you want to be a person with a large vision, you must cultivate the habit of doing the little things well. I have a choice: Do I want to align with the GREATEST VISION OF MYSELF or Do I want to align with my EXCUSES? God gives us the vision, then He expects us to walk in obedience. As we do, the resources we need come to us. When I was 18, the vision was to make music that didn't exist, because everything else was so unsatisfactory. So awareness and enjoying this life can grow together simultaneously. And this is my vision of the whole man. Data only exists within the framework of a vision you're building to, a hypothesis of where you're moving to. Reality is always the moment of vision before the intellectualization takes place. There is no other reality. Faith is a re-directing of our sight, a getting out of the focus of our own vision and getting God into focus. When God gives a command or a vision of truth, it is never a question of what He will do, but what we will do. Many pastors fail to see God's vision fulfilled because they never have a strategy for fulfilling that vision. 'Camp' is a vision of the world in terms of style - but a particular style. It is the love of the exaggerated. My life's purpose is to write poetry - but behind the poetry must be the vision of a fresh revelation for men. My vision is a future for humanity where we will be completely free to pursue activities outside of our planet. 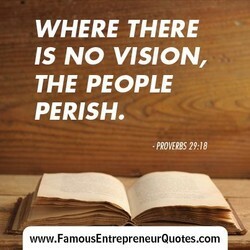 Without a vision our community will perish without Christ, but without a vision the church will perish as well. Step 1 in casting vision is to make sure your people love Jesus more than they love the vision you are casting. Just as no great painting has ever been created by a committee, no great vision has ever emerged from the herd. Things never happen on accident. They happen because you have a vision, you have a commitment, you have a dream. Insight is 'mental vision,' one of the ways in which the mind escapes the limits of the obvious or the familiar. God in his wisdom circumscribed man's vision, and rightly too, for otherwise man's conceit would know no bounds. Malcolm X had a clear vision and an understanding that we were - that he was a part of a broad freedom struggle. The vision Donald Trump has articulated to Make America Great Again means a stronger America at home and abroad. It's hard to differentiate between a vision and a delusion - both cause you to see things that no one else sees. A movie's very different from the book, and it's different from the script, and it's usually one person's vision. He wondered if normalcy was something, like vision or silence, you didn't realize was precious until you lost it. Hecate teaches us that the way to the vision that inspires renewal is to be found in moving through the darkness. Racism is a phenomenal thing; it is like a thick mist that obscures the vision and judgement of even great minds. It's so important to create in your own voice, to hold onto what makes you unique, and have faith in your vision. Each of us has a vision of good and of evil. We have to encourage people to move towards what they think is Good. Bravery shows up in everyday life when people have the courage to live their truth, their vision and their dreams. It is very important that the president thematically shows where we're going in terms of the vision and an agenda. With me, my main vision for life was to avoid as many people as possible. The less people I saw the better I felt. When you lose your vision, you lose contact with things. When you lose your hearing, you lose contact with people. 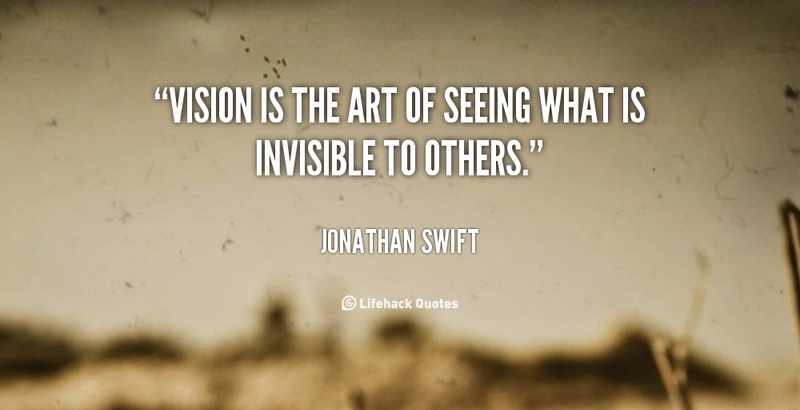 Have as much fun as you can and don't feel that the edge of your canvas confines you - let your vision go right on. I'm a woman with a mission. I've learned to believe in myself, my vision and to do things the way I want them done. The world of sight is still limitless. It is the artist who limits vision to the cramped dimensions of his own ego. I have a vision for living. It's about elements of style. It's about all the things that I love, that I believe in. I do believe I am special. My special gift is my vision, my commitment, and my willingness to do whatever it takes. All art is a vision penetrating the illusions of reality, and photography is one form of this vision and revelation. A great teacher never strives to explain his vision. He simply invites you to stand beside him and see for yourself. The intensity of vision in the artist and of vividness in his creations are the sole tests of his imaginative power. The blindness that opens the eye is not the one that darkens vision. Tears and not sight are the essence of the eye. Take the limits off of yourself. You will never rise higher than your thinking. 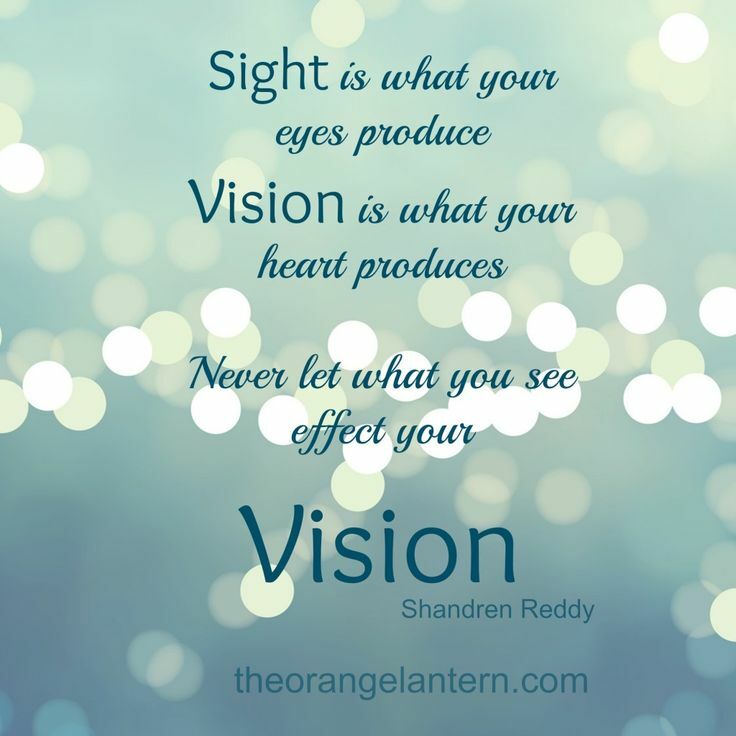 Create a great vision for your life. Nothing is more important for mature Christian discipleship than a fresh, clear, true vision of the authentic Jesus. The Budget is in line with our vision for a skilled & digital India, guided by Mantra of 'Sabka Saath, Sabka Vikas'. The transposition that a painter makes with an original vision gives to the representation of nature a new interest. An object is frequently not seen, from not knowing how to see it, rather than from any defect of the organ of vision. Environmentalism is not about the environment. It is about people. It is about a vision for a better life-for people. The vision of an entire world becoming just like us is at least as discomfiting as the thought that most of it won't. Religious traditions can be reinterpreted in a manner that assists healing, corrects distortions, and expands vision. Technology has a critical role in realizing the vision of a Digital India - the power of 125 crore connected Indians. Without an elite in the arts, we have no leaders, which is to say we have no vision, which is to say we have no arts. He [Steve Jobs] had more of the future vision: We can bring this to everyone; we can start a company; we can sell it. Will America lead...and reap the rewards? Or will we surrender that advantage to other countries with clearer vision? There are plenty of bad editors who try to impose their own vision on a book. (â¦) A good novel editor is invisible. 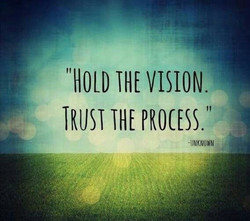 The first job of a leader is to define a vision for the organization...the capacity to translate vision into reality. Strength is derived from unity. The range of our collective vision is far greater when individual insights become one. The final goal ... is to grasp the native's point of view, his relation to life, to realise his vision of his world. With vision only, you get no follow-through. With enforcers only, the vision is realized but leaves a lot of wreckage. If we give purely, it opens up a doorway in our heart and it gives us the vision to see that those we give to are God. This is still a lot of blocking and tackling. I'm not seeing the kind of vision thing associated with a frothy market. A leader without the vision, to strive to improve things, is no good. Then you will just stay put, you won't progress. 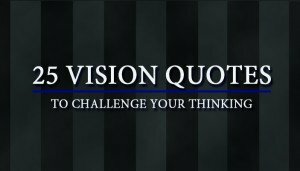 When your vision is a biblical vision, the people arguing with it are not arguing with you. They are arguing with God. It is hard to follow one great vision in this world of darkness and of many changing shadows. Among those men get lost. Leadership is building a bridge that connects the vision with the purpose, in order to empower those who are around us. The only quality that endures in art is a personal vision of the world. Methods are transient: personality is enduring. And though St. John saw many strange monsters in his vision, he saw no creature so wild as one of his own commentators. I never imagine myself as anything. I've never had a goal or any future vision at all. I just do what's in front of me. You have to be tenacious, you have to be focused, you have to have a real vision, and be extremely passionate about it. Decisions are being made a mile a minute while you're making the work, and it has to come out of experience and vision. A single vision is more perfect than a committee vision because with everyone having their say, it becomes compromised. Faith is nothing else than reason grown courageous - reason raised to its highest power, expanded to its widest vision. The greatest player in the world. He's got a fantastic vision of the game, and what he can do technically - it's crazy. Look at the world with the vision of peace, love, and compassion. Then the whole world will appear loving and peaceful. What difference would a clear vision of my principles, values, and ultimate objectives make in the way I spend my time?